"We are the Champions", "We will rock you" or "Bohemian Rhapsody" - Queen made rock history. Up until now, the hits of the quartet from the UK not only make die-hard music fans of the 70s and 80s dance and sing along. With the award-winning film "Bohemian Rhapsody" the band set a cinematic monument. The British tribute band "The Bohemians" revives the myth pf the legendary band in a brilliant show. First-class musicians, singers and entertainers present Queen's greatest hits in a two and a half hour show with songs from the early days to their later works. From disco classics to rock ballads. The English producers of the show have not spared on elaborate costumes and show effects, so the audience will feel sent back in time to the golden age of rock music. 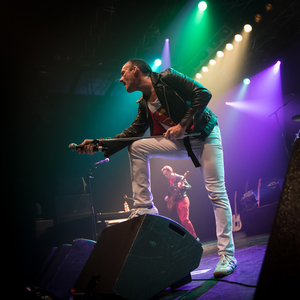 With Rob Comber "The Bohemians" have a front man who delivers an authentic and top-class homage to Freddie Mercury, both vocally and visually. From the distinctive moustache to the electrifying, energetic movements, he comes as close as possible to his idol. Voice power and performance make the memory of one of the greatest rock bands of all time an extraordinary experience. With their joy of playing, stage presence and passion "The Bohemians" ensure that spark is quickly ignited. the best conditions for a moving concert evening with fantastic music - both for die-hard Queen fans and for those who discovered the band after Freddie Mercury's death.